Baggage Capacity 53 cu. ft.
Made by one of the largest aircraft manufacturers in the world, Brazil-based Embraer, the Phenom 100 is a very light twin-engine jet that is a favorite private jet charter. The Phenom 100 can accommodate four passengers and has a comfortable range of 1,160 nautical miles and can climb to 37,000 feet in just 23 minutes. First introduced in the U.S. in 2011, this modern business jet received another major upgrade in 2016. It’s the perfect selection for flying from city to city when you’re traveling light. 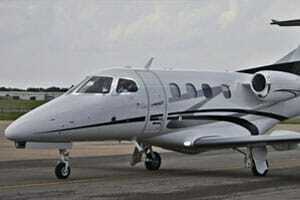 The Phenom 100 is also a powerful plane. Two Pratt and Whitney PW617F-E engines power the Phenom 100, providing a thrust for takeoff of 1,695 pounds each. These engines employ a FADEC (Full Authority Digital Electrical Control) system, making them extremely efficient and straightforward in flight. Large windows complete the modern feeling on board this aircraft, while an integrated air stair makes deplaning on the tarmac a breeze at smaller and secondary airports. The Phenom 100 EV dispels the notion that an aircraft in the Very Light Jet category has to sacrifice power and comfort to be attractive to the business jet charter customer. 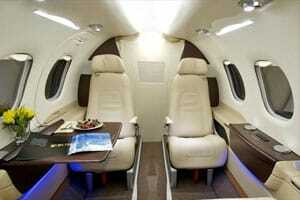 It is a single pilot aircraft with a crew alerting system, dual-channel digital flight control, and much more. As for comfort, the contemporary interior was designed by BMW’s renowned Designworks USA and also includes an enclosed lavatory. Integrated USB Power outlets make keeping your devices charged and ready to go when you need them.